You'll get the feel of Hawaii in this luxurious two bedroom, two bath residence with den which was originally selected and furnished as a model because of its sweeping uninterrupted view of ocean, golf course and pond. Located on the ground floor, it is the largest of Kumulani's 3 different floorplans. You will enjoy breathtaking views from the 375 sq. ft. wrap-around lanai, the spacious great room, the master bedroom, and well appointed kitchen. You have use of our Weber gas BBQ located on the lanai. You may enjoy the world famous Mauna Kea Beach and Hapuna Beach public beaches at no cost to you. We will provide you with beach chairs, beach towels, boogie boards, etc. Or for a fee (*see below) you may experience the privileges of a guest at both the world renowned Mauna Kea Beach and Hapuna Beach Resort Hotels, including charging privileges at both hotels, 36 holes of championship golf and tennis club rated best in Hawaii at hotel guest rates, fitness center, spa, two pristine white sand beaches, two hotel swimming pools, beach lounge chairs, towels, umbrellas and showers. Surround yourself with the luxury, elegance, and all the amenities of one of the world's finest resorts. Included with this fee are free parking with key card and free valet service at both hotels. It is fully air-conditioned and has ceiling fans in the great room, both bedrooms, the den and lanai. You won't have to miss your favorite Sports and TV shows because we have provided a Digital Recorder in the den, as well as a new 55" smart TV to enable you to stream your favorites from Netflix. There are four TVs -- in the great room, the den, and both bedrooms. There are three DVD players -- in the great room, the den and the master bedroom. Our Great Room soundbar will allow you to connect to Bluetooth devices. The stereo system has an I-pod dock that will allow you to listen to your own music and CD player. The master bedroom, with its comfy king sized bed, has its own private bath with twin sinks, shower, soaking tub, and walk in closet. The second bedroom has twin beds and there is a second bathroom adjacent. Couches in both great room and den convert to Queen beds. You can comfortably sleep six in this tropical setting. For Internet users, we have high speed cable with wireless connectivity and a convenient computer desk in the master bedroom. We provide boogie boards, masks and snorkels for your swimming pleasure. The unit is equipped with playing cards, Yahtzee, dominoes, Monopoly, card shuffler, foldout card table and four folding chairs (for the avid card player). The Kumulani recreation pavilion has its own private pool, Jacuzzi spa, chaise lounges, tables and chairs, and BBQ facilities. Other condos at Kumulani may offer less expensive rates, but their views are interrupted by rooftops. Ours is unique!!! The view you see is only available from this building, although it is shown by others! Call Rose Marie for more information and a free DVD with detailed pictures of condo, panoramic ocean and golf course views, and resort facilities. *Membership privileges are available for purchase to use the Club at Mauna Kea facilities (separate from rental costs): $75 + tax per day, per home/condo for stays up to 20 days. Flat fee of $1125 for 21-30 days, $1875 for 31-45 days, and $2250 for 45-60 days. Purchase of this membership includes: Charging privileges at all hotel facilities, access to two oceanfront hotel pools and showering facilities, use of lounge chairs, umbrellas and towels at the beach and pool, reduced golf rates at the Mauna Kea and Hapuna courses, hotel guest rate at the Mauna Kea Seaside Tennis Club, use of two fitness centers (yoga and group classes for a fee) and access card for preferred hotel & beach parking. **Two free Mauna Kea Golf passes (a $500 value) for play after 11:00 a.m. given with 15 or more days rental. We are a retired couple who love Mauna Kea Beach and spend 4-5 months here every year. When this beautiful place with unbelievable unobstructed views became available, we couldn't pass it up. We closed escrow December 31, 2007 and have been enjoying our condo ever since. This picture was taken when our daughter visited in winter 2008. Mauna Kea Beach and Hapuna Beach are two of the most beautiful beaches in Hawaii. Rockefeller had the opportunity to build his luxury hotel - Mauna Kea- at any location in Hawaii and picked this location for it's beautiful beach and incomparable setting. 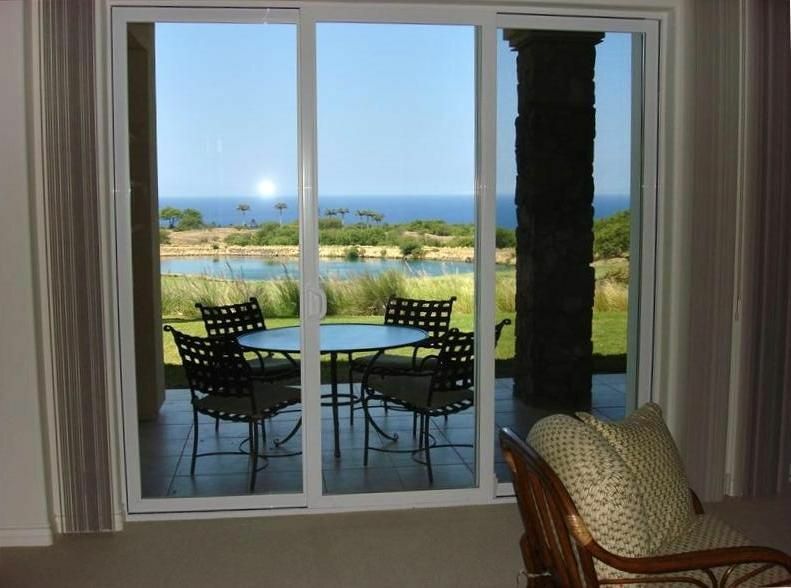 Our condo has beautiful views of ocean and golf course and is the perfect vacation spot. You have all the privileges of a guest at Mauna Kea Hotel with the spaciouness of a large condo with a breathtaking view. Master bath has double sinks, separate tub and shower. Second bathroom has shower. Toaster accomodates wide slices of toast and has setting for bagels to toast one side only. Salt, pepper, sugar, lots and lots of seasonings, automatic dishwasher soap, cleanser, laundry detergent plastic wrap, foil, toilet paper, paper towels, Kleenex and more. Fully equipped kitchen with coffee maker, electric mixer, blender, rice cooker, complete set of Calphalon pots and pans. Salt, pepper, sugar, seasonings, paper products included. Available at discount for guests who sign up for hotel amenity program. Boogie boards, swim fins, masks and snorkels available in garage. Drying rack, cards and games, basic seasonings, and paper products in condo. We had a fantastic time at Rose Marie's property. The location was great, the view was amazing, and everything was perfect! We hope to be back next year! Very close to the two best beaches on the island! Has everything you need for cooking and going on day trips. Beautiful view off patio. Beautiful view, comfortable beds, close to everything. Owner had everything. This was the perfect place for us. We stay for 7 days and enjoyed the condo and amenities and look forward to returning. The kitchen was well stocked, plenty of beach accessories such as boogie boards, shoes, snorkel equipment. We used the community pool which was convenient. We signed up for the residential guest program at Moana Kea and i would definitely recommend this to anyone staying in the area. This is the third or fourth time we’ve stayed in this condominium on the Mauna Kea Resort property on the Kohala Coast of the island of Hawaii. We were fortunate to find this unit on VRBO and have always enjoyed our stays. Rose Marie is a wonderful host and has always been attentive to any request we’ve made. The unit is clean, nicely decorated and has a stunning unobstructed view across the golf course to the ocean. The weather on this part of the island is not adversely impacted by the Vog that the southern end of the island can be impacted with from the Kilauea volcano. To maximize your enjoyment of the resort property, we highly recommend you splurge on the optional hotel amenity package. $295 per night (7 night min). Call or email for discounted rate for nine or more nights. Two free golf passes good until Dec. 15 for 7 day rental. Holiday rate 12/17/16 to 1/4/17 - $548- 7 night min. Hawaii tax ID W55156245-01. Add Hawaii tax of 13.416% and $200 cleaning fee.